Guarding the legacy of this century-old residence in the CWE, the owners have become part of its astonishing history. Every detail of the mansion's formal dining room reflects the ornate luxury favored by St. Louis' elite at the turn of the century. 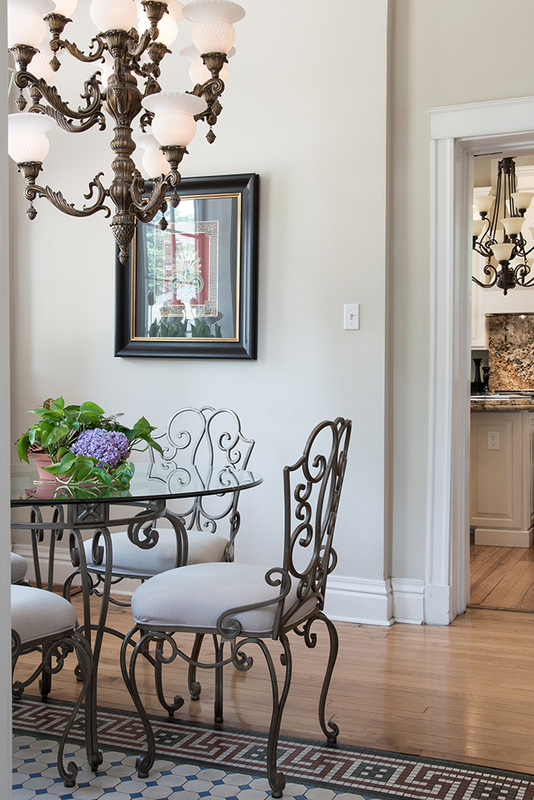 Once used exclusively for flower arranging, this sunny space is now the breakfast room. Set with the owner's heirloom Haviland china, the mahogany dining ensemble can easily seat ten. Ascending gracefully from the foyer, the grand staircase leads to a breathtaking solarium. The foyer's centerpiece is an antique French table, inlaid with metal and leather and embossed with gold. 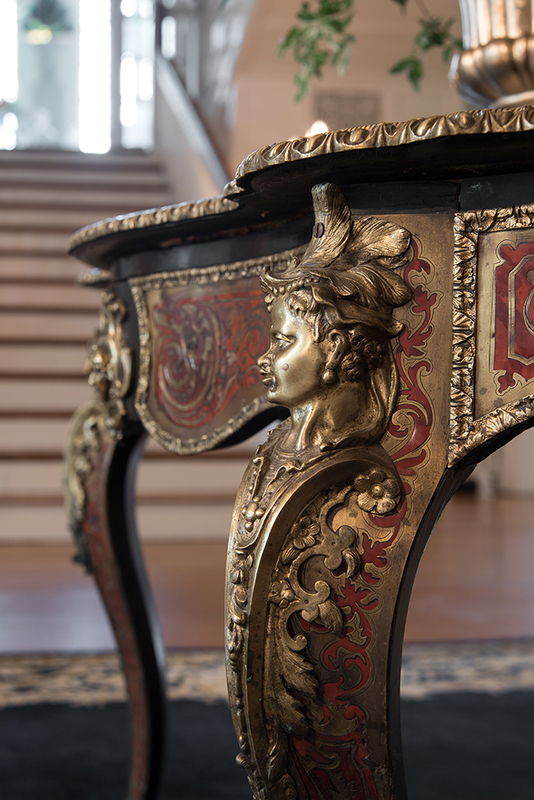 A detail of the cabriole table leg's Rococo Revival ornamentation. An architectural treasure-trove, virtually all of the solarium's features are original, including the hand-painted windows, elaborate plasterwork, recessed lighting and tile flooring. 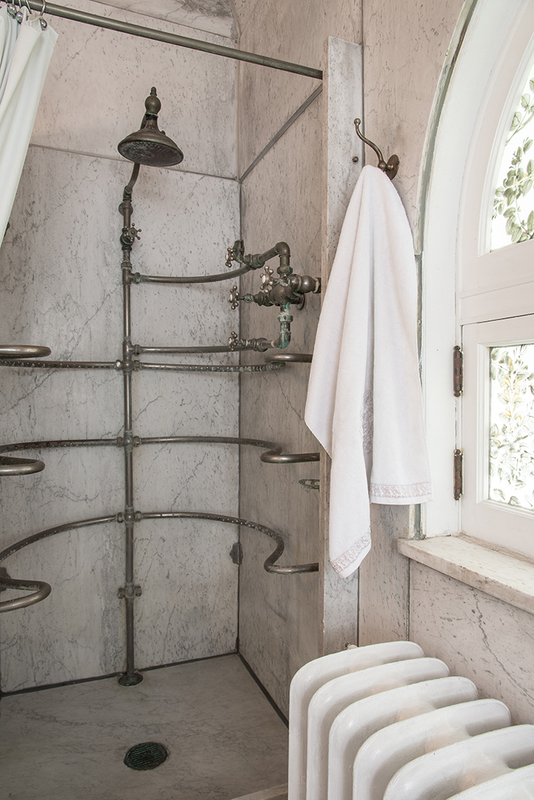 Blanketed with marble and equipped with its own water heater, the former master bath is totally original and surprisingly innovative. 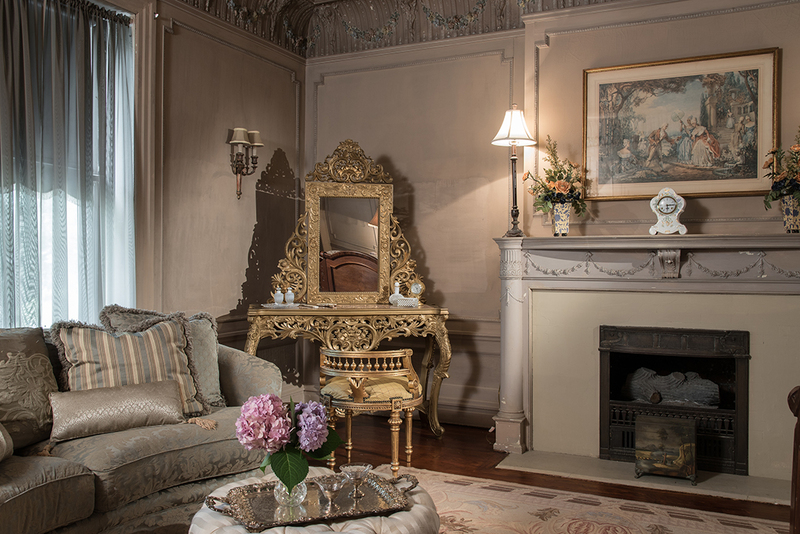 Originally the McBride's master bedroom, this guest suite includes a sitting area furnished with a dazzling antique gilt dressing table. Like many of St. Louis’ stately World’s Fair-era mansions, Patti and Kevin Short’s majestic three-story harbors a wealth of history between its walls. Fortunately, much of this landmark’s colorful story has been well documented over the years. It’s been a featured stop on the Central West End House Tour several times and even the subject of an HGTV episode. The next six months were spent refinishing the floors, upgrading the plumbing and electrical systems and installing central air. From the outset, however, “preservation” was Patti’s main objective. She diligently researched the home’s past and scoured antique stores and estate sales for authentic period furnishings. Designed and built by prominent St. Louis architect Jerome B. Legg from 1904-06, the styling of this 25-room, 11,000-square-foot residence has been variously described as Beaux Arts or Second Renaissance Revival. No expense was spared during construction, and it was undoubtedly the home’s sheer opulence that attracted its original owner, oil tycoon William Cullen McBride, known citywide for his extravagant social gatherings. In 1921, for example, McBride hosted a debutante ball for his daughter, Dorothy, and 500 guests, themed “A Night in Venice.” At an estimated cost of $2-$3 million in today’s dollars, a man-made moat was excavated on the property, and gondolas ferried party-goers across the water to a huge canvas structure erected for the festivities. Fast forward to the 1960s, when entertainment personality Stan Kann owned the property, comedienne Phyllis Diller was a frequent houseguest, and NBC asked Kann to host a cocktail party for The Tonight Show’s Johnny Carson and a “few of his friends” – a guest list that burgeoned to 400! Not long after becoming the estate’s newest owners, the Shorts met Kann at a social function. “That was my favorite house!” Kann exclaimed, and as the three exchanged memories, another sign of destiny emerged. Kann had once authorized a poster depicting the mansion with one of his numerous Pierce-Arrows parked in front and a caption reading, “My tastes are simple. I only like the best.” That same poster had hung in Kevin’s dorm room during his college years! 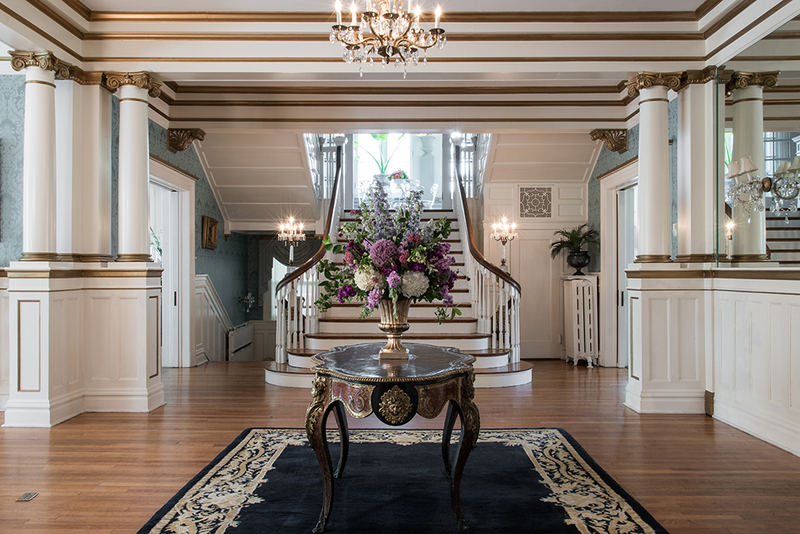 Remarkably, most of the mansion’s lavish features have been faithfully preserved for more than a century, including the original oak flooring, imported from Europe. Bordered with gold leaf, elaborate detailing and ornate plasterwork, the ceilings soar to 11 feet on the first and second floors, and pocket doors glide between 8-foot openings. 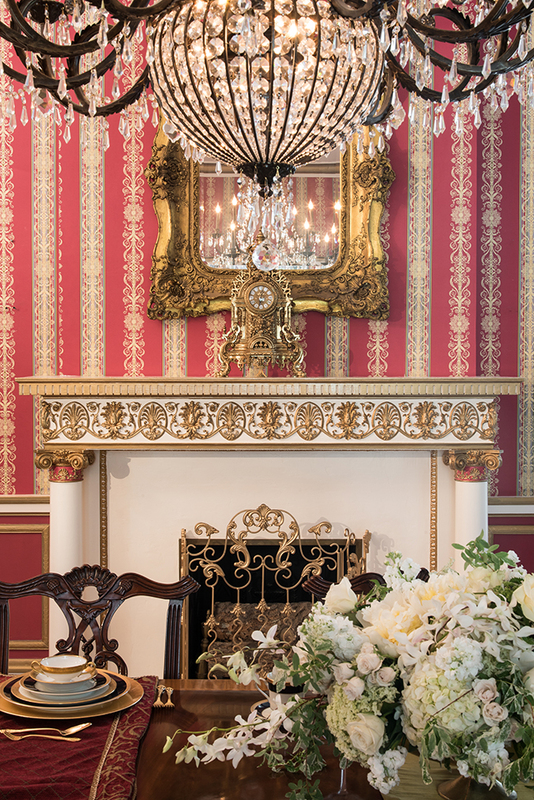 Showcasing their original mantels, all nine fireplaces were – and still are – fueled by gas. An exciting innovation at the time, the light fixtures were wired for electricity, with gas as a backup in the event of power failure. 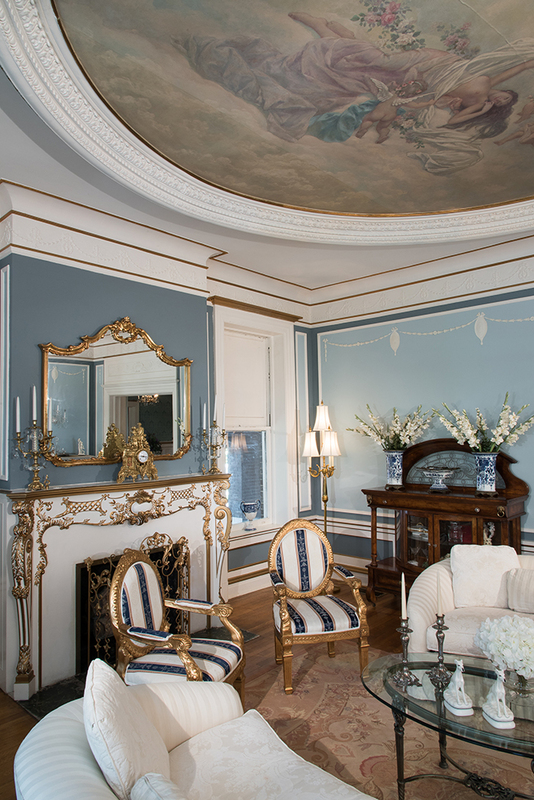 Off the vast columned foyer, the ladies’ parlor is often referred to as the “Wedgewood room,” due to its soft-blue walls and delicate white-plaster trim. Overhead, a circular Tiffany oil painting in exquisite pastels dominates the ceiling and was commissioned specifically for this room. Opposite the ladies’ parlor is the music room, a bold contrast with its rich merlot and gold tones. 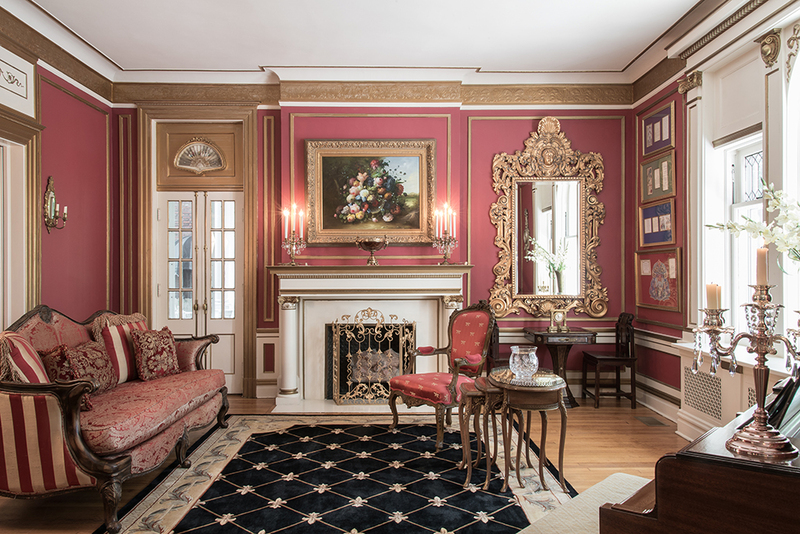 In one corner is the Shorts’ family-owned Chickering piano, and flanking the elegant fireplace, a massive gilt-framed mirror balances French doors leading to the side porch. 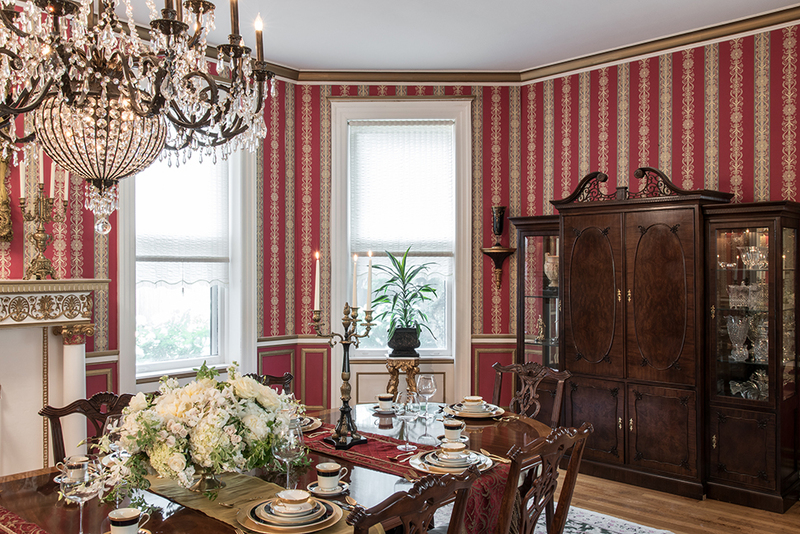 The merlot-and-gold color scheme is repeated in the striped wallpaper of the formal dining room, where the 12-foot mahogany table can easily seat ten. Patti notes that the massive antique crystal chandelier was a replacement for the original fixture, but her 18 heirloom china settings have found their rightful place. Once belonging to her great-aunt, the French Haviland porcelain was fired in 1904, making it exactly the same age as the house. Although updated, the kitchen further demonstrates the Shorts’ commitment to preserving the home’s authenticity. Somewhat small by today’s standards, the kitchen’s dimensions weren’t altered, and the cabinetry was custom-designed for needed storage space, while accurately reflecting the style of the era. 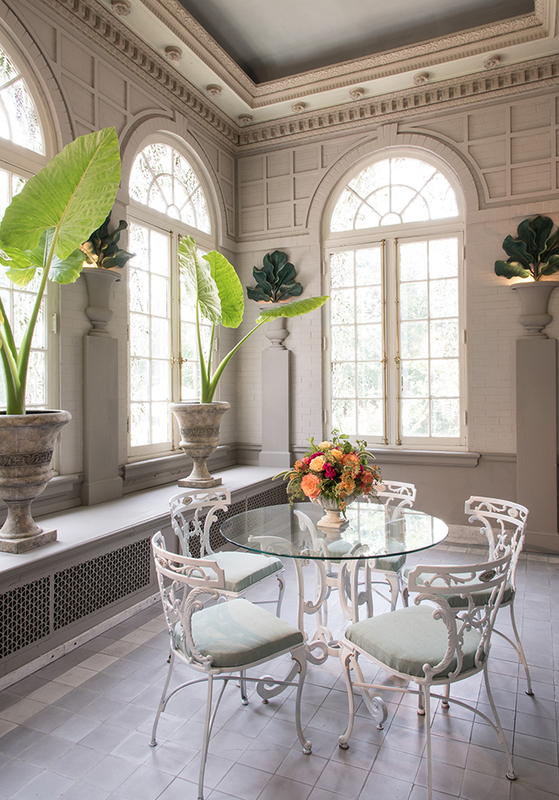 Once used exclusively for flower arranging, the adjacent room was converted to a cheerful breakfast room. The mansion’s grand staircase rises to an awe-inspiring solarium, where hand-blown lightbulbs are recessed into the 15-foot tray ceiling, prompting the owner to lament, “The bulbs are all original and can’t be reproduced.” Similarly irreplaceable, the solarium’s monumental radius windows are hand-painted with wisteria and separated by plaster columns and urns filled with plaster art leaves, a decorative motif fashionable in the 1920s. With justifiable pride, Patti mentioned that the leaves had been removed by a previous owner, but she managed to locate and reinstall them. Upstairs, it becomes evident that many of today’s “innovations” aren’t really new at all. Much like the modern loft, the expansive second-floor hall served as a “family room,” surrounded by the bedrooms. Formerly the McBrides’ master suite, the fireside bedroom is now reserved for guests and features a hand-carved/painted frieze, the original electric sconces, even a laundry chute! Furnishings include a massive French bed from Louisiana, a gilt dressing table, and an inviting curved sofa in the sitting area. Totally original, the adjoining bath is a true eye-opener. 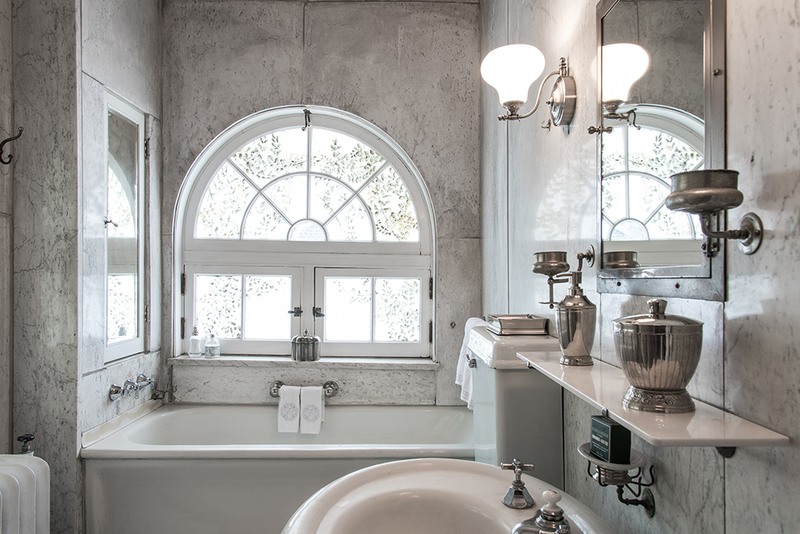 The walls and ceiling are lined with marble; the radius windows are hand-painted; the tub is floor-mounted; and the pedestal sink is topped by a mirrored toiletry cabinet. And equipped with its own water heater, the separate shower enclosure is one of two in the home fitted with full-body “needle” sprays and a rain shower head! Outside, the private drive passes under the porte-cochère to a 4,000-square-foot carriage house that once housed the McBrides’ coaches and stables (and later, Kann’s Pierce-Arrow collection). Part of the original estate grounds and currently occupied by a not-so-historic house, the adjacent property was also acquired by the Shorts, who plan to convert the structure to a pool and guest house. Whether destiny, serendipity or merely coincidence, St. Louis is fortunate that this spectacular landmark is now home to a couple who genuinely treasure its historic significance and continue its legacy of gracious hospitality.